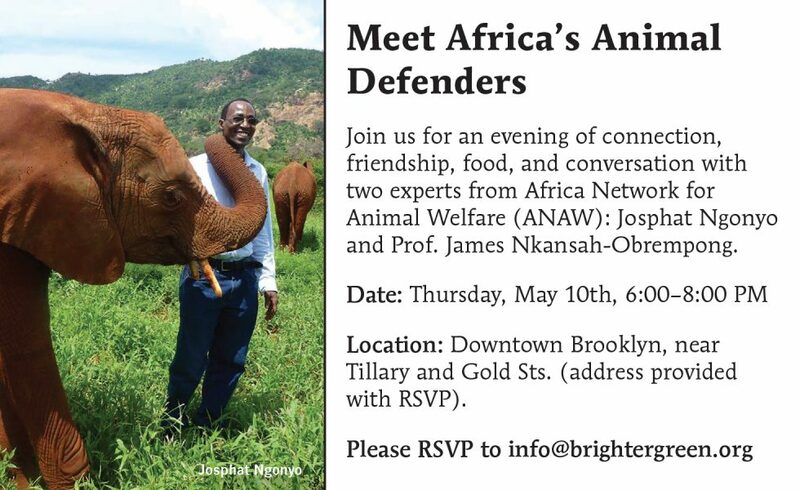 Please join us for an evening of conversation with Josphat Ngonyo and James Nkansah-Obrempong from Africa Network for Animal Welfare (ANAW). Location: Downtown Brooklyn, near Tillary and Gold Sts. (address provided with RSVP). Nearest subways: DeKalb B/Q/R, Jay St. Metrotech F/A/C/R, Hoyt St. 2/3. Parking available in building’s garage. Ruby Wells, Sangamithra Iyer, and Mia MacDonald invite you to an evening of connection, friendship, food, and conversation with two experts from the Nairobi-based group ANAW: Josphat Ngonyo and Prof. James Nkansah-Obrempong. 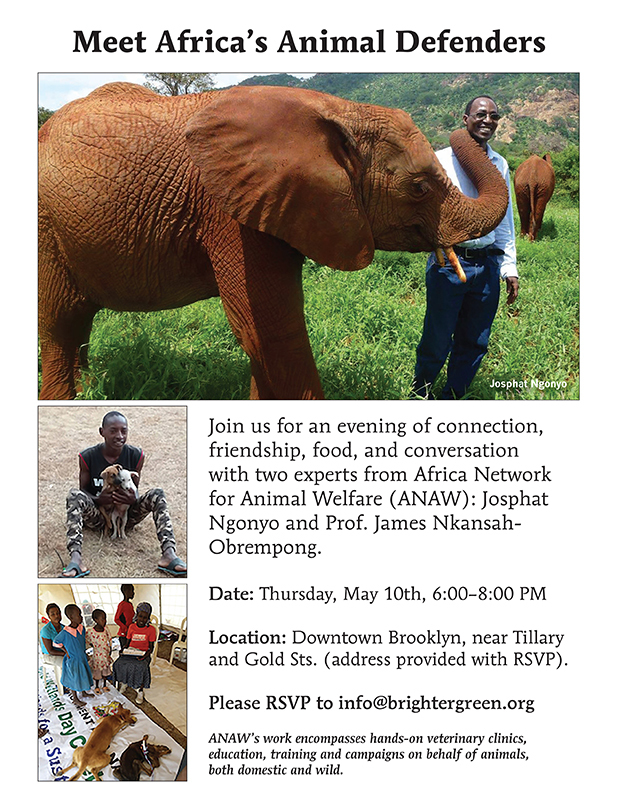 They will discuss conservation, development, and the protection of animals and local communities, and how ANAW is addressing urgent issues of elephant poaching and the ivory trade, as well as the export of donkey hides to China. Donations to support ANAW are encouraged and welcome. Artisan products from Kenya will be available for sale. Josphat Ngonyo is the founder and director of ANAW, with more than 15 years’ ​experience in wildlife conservation. He is a past executive director for Youth for Conservation​, ​and member of the Global Task Force for Farm Animal Welfare and Trade and the United Nations’ Food and Agriculture Organi​s​ation’s Gateway to Farm Animal Welfare editorial board.